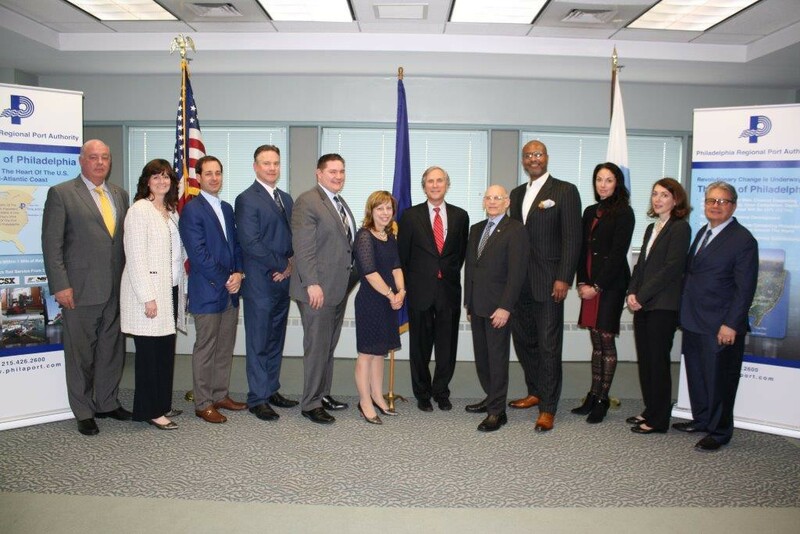 The Philadelphia Regional Port Authority (PRPA) Board of Directors hosted the inaugural meeting of the Port of Philadelphia Advisory Committee at PRPA’s headquarters on Tuesday, April 12. The Committee, established by PA Governor Tom Wolf in December 2015, will regularly advise the Board and staff of PRPA on relevant port issues. Comprised of business, labor, and government officials selected by Governor Wolf, the Port of Philadelphia Advisory Committee was formed to provide an effective, transparent forum to ensure an ongoing, substantive dialogue between PRPA and its stakeholders. As indicated by its title, the committee will be advisory in nature and will meet with PRPA Board Members and staff on a quarterly basis. Agenda items will include, among other topics, port strategic and real estate planning, macro maritime industry conditions, port infrastructure requirements, and the optimization of market opportunities. 11 of the 14 appointees to the committee attended the initial meeting, which included an overview of the Port, a report on the Port’s 2015 cargo statistics, updates on the 45-foot channel-deepening and Southport projects, a PRPA financial report, an update on PRPA’s search for a new CEO, the ongoing study of the Port by the PA Dept. of Transportation (PennDOT), and, finally, an overview of PRPA’s Procurement and Diversity programs. and Harvey Weiner, president, Dependable Distribution Services – operator of PRPA’s cocoa complex at Pier 84. PRPA will report on future meetings of the Port of Philadelphia Advisory committee as they occur. James H. Paylor, Jr., vice president of the International Longshoremen’s Union; Jennifer M. Tanner, PCED, industrial development manager for CSX Corporation – representing Rodney Oglesby; Leonidas Addimando, co-founder and managing partner of the Alterra Property Group, who represented Pennsylvania State Sen. Lawrence M. Farnese, Jr.; James Snell, business agent for Steamfitters Local Union 420; Philadelphia Deputy Mayor Rich Lazer, who represented Philadelphia Mayor Jim Kenney; Denise Brinley, Special Assistant to the Secretary – Strategic Industry Initiatives, Pennsylvania Department of Community and Economic Development; PRPA Board Chairman Gerard H. Sweeney, president and chief executive officer of Brandywine Realty Trust; Harvey Weiner, president of Dependable Distribution Services; Wadud Ahmad, partner of Ahmad Zaffarese, LLC; Chelsea Guzowski, Director of Special Projects, Pennsylvania Office of the Budget; Kate McNamara, vice president, real estate service, Philadelphia Industrial Development Corporation; and Robert W. Palaima, president of Delaware River Stevedores.